The Microdermics team receiving the 1st prize package. Monday, September 26th was an exciting day for UBC MECH faculty and alumni, receiving several awards at this year’s BC Innovation Council’s (BCIC) New Ventures Competition. The competition is one of North America’s largest technology business idea competitions, which attracts BC entrepreneurs from a wide range of industries including cleantech, ICT, bioenergy, agritech, life sciences and more. 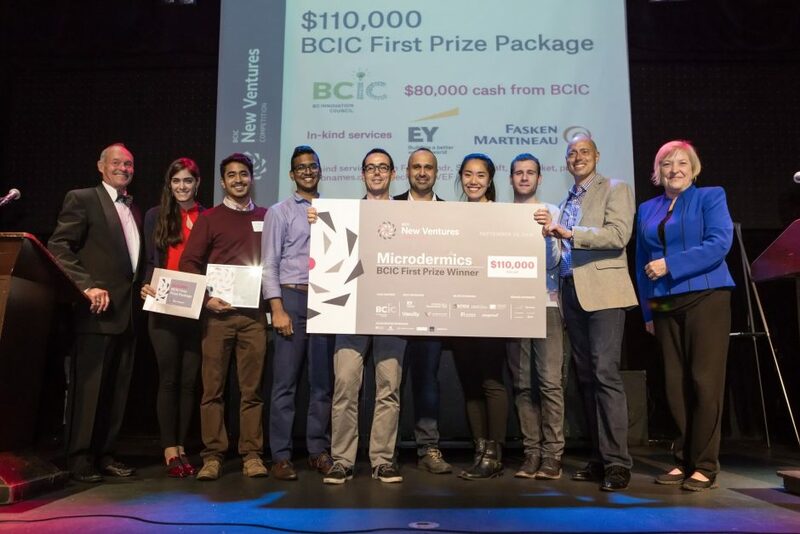 Microdermics Inc., a Vancouver based start-up and UBC spin-off co-founded by professor Boris Stoeber and alumnus Dr. Iman Mansoor, was awarded first place in the competition, which includes a prize package valued at $110,000. The company was also awarded the CDRD Life Sciences Prize for their contribution to health-related research and product innovation. Microdermics received the BCIC award for the development of a hollow metal microneedle injection system, a painless alternative for delivering vaccinations and therapeutics, and monitoring drugs in the bloodstream. Their product could one day replace costly, invasive hypodermic needles and improve patient comfort. Iris Automation, whose CTO James Howard graduated from UBC Mechanical Engineering in 2016, placed third for their development of a collision avoidance system for industrial drone use. The system allows drones to “see, think and have situational awareness like humans do,”* which allows the drones to be used for agricultural surveys, pipeline inspections, mining exploration, search and rescue, and more. In addition to the $35,000 third prize package, Iris Automation also received the $22,000 BC Resource Industry Prize. Sensible Building Science, founded by MASc MECH alumnus Stefan Storey, was also awarded the $10,000 City Innovation Prize at the event — a prize presented to the top performing venture whose primary market or potential primary market are city departments or agencies. The company received the award for their dedication to creating “smarter” buildings, or buildings equipped with controls which are able to base ventilation and heating decisions on the exact location of people, leading to less energy consumption, increased ventilation, and more comfortable occupants. Congratulations to all three companies for your exciting successes! To read more about the BCIC New Ventures Competition and UBC faculty and alumni success, visit their blog.